There’s an undeniable appeal to bare-bones acoustic music. The lack of colorization – electric guitars, drums, etc. – makes the songs more straightforward, more delivered. “Less is more” is definitely the key here. The appeal is simple: the artist’s voice, an acoustic guitar or piano, and that artist’s soul. It’s the musician demystified. The artist naked. In recent years, however, the term “acoustic” could mean a singer/songwriter or band at their very core. Just the essentials are required: the voice, the instruments needed, and the music. When the music written calls for a “plugged in” electric sound, it can still be classified as Acoustic; although purists may bat an eyelash or two. Music, like everything, evolves. The use of technology like loopers or pedals or an electric bass or a vocal harmonizer becomes essential to an acoustic sound. The instruments used takes a backseat to the artists and their voice. Fete Dela Musique’s Acoustic Stage at A Space Manila, now on its second year, highlights just that: the artists and their voice. This year’s Acoustic Stage was an eclectic showcase of talents ranging from singer/songwriters to indie electronica acts to bands that aren’t known for their stripped down music. We had returning acts like Toni B., a natural performer who never disappoints. She can go from saint to sinner, coy to carnivore, in a blink of an eye. Indie doll Reese Lansangan whose sugary sweet vocals and undeniable charm pulls the audience’s eyes and ears towards her; her presence alone has its own gravitational pull. We had artists stepping on Fete dela Musique’s Acoustic Stage for the first time. There are fresh faces and veterans aplenty. All impressive talents deserving of being on a stage. Among the fresh faces are Lime, a group that hails far south in Laguna, Alt.Rockers who are the perfect example of a band unplugged. Their music – their sound – is familiar; it’s reminiscent of a now-retro era. Aleph, an enigmatic presence whose music originally leans towards a more electronically textured slant, dazed the crowd with her voice that recalls one Florence Welch. Her voice feels right at home with an acoustic guitar backing it up as it is with synths and drumbeats. There’s the 19 year old prodigy Mariel Wang, a personal favorite, whose nervousness was evident but still managed to win over new fans. We had vets like Basti Artadi, a man known for his howling voice that defined a generation. Be it with his ten ton truck of a band Wolfgang or with an intimate setting composed of an acoustic guitar, a bass, and a cajon, his vocals is still inarguably a force of nature. 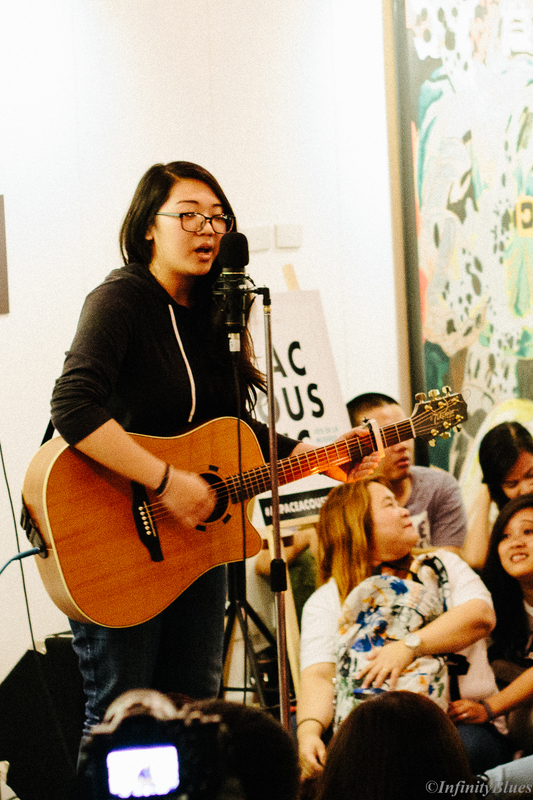 Aia de Leon, a brilliant and talented artist, whose set was one part stand-up comedy bit and two parts confessional – the audience being the collective priest. Soul jazz band Sinosikat? who wowed the audience with acoustic versions of their fan favorites. All of these performers, along with the others that night, more than accomplished what Fete dela Musique’s Acoustic Stage was set out for: to show the world a side of Filipino musicians that not everyone sees – that the Filipino musician can make an impact with just their voice and a few key instruments. Less is definitely more.